ation in the Next Decade." ctors Weekend Conference, in Hollywood, Fla.
hPlotkin Irwi" Levy, welcome guest speaker. Dr.
Society is not that homogeneous. received in the previous 25 years. plea Falasha leader Yona Bogale. Party for another two-year term. leave for Israel, Goldflam said. a proven and outstanding one,"
secure and safe with Carter?" presently a member of its board. has a home in Jerusalem. of the Jewish Federation. Dr.
the area of care for the aged. within the next few years,"
advice and the gift of service." sense of empathy with them." are the author," she said. performed by Dr. Howard Kay. position in the United Nations. are for a so-called small nation,"
strong to amount to anything,"
photographers in the I. S.
sides of the line to meet. defected to Israel last Monday. He was identified today as Pvt. firmation of Marriage" 8 p.m.
Auditorium on Sunday, Oct. 17.
tickets in advance bv calline. Patron tickets will also h.
R.L. NEWHART.Mor. W.R. ZERN.L.F.D. E.B. ADAMS.Mar. "Serving the Jewish Community Since 1924"
shipyard and other new projects. Pounds Sterling to the island. New Year with a combined "Shabbat-L'Shana Tova"
la rtw 1*74-77 CNMMrWTY PH-SCNO01. f plWi H* it ihcImiJ. that country raises many questions. attempts by international Palestinian terrorists. fact, Mexico itself fails to see this. many parts of the world from the United States. Nazi literature in several languages. Party which is headquartered in Arlington. 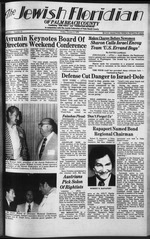 Combining "OUR VOICE a.id'TEDERATION REPORTER"
Published Bl-Weekly Second Class Postage Paid at Miami, Fla.
Hyman Fishman, Dr. Howard Kay, Kenneth Scherer, Dr. Richard Shugarman, Or. Submit material for publication to Rennl Tartakow, Director of Public Relations. beginning to do that, too. in a very predictable way. know what a real debate is. ponent nor even simply reply. As for facts and figures. virtues of, say, Anacin vs.
ill-used by the first non-debate? terms, which is to say with,! issues, I must ask my owi! erupt at a Cabinet session here. of territory to defend itself, wen ! our brethren in distress," the message said. Tulkarem was shot in the leg. was hit by "warning shots"
narrow alley of the Old City. when they fly to New York. Now on National, they can. Already Booked On Another AJUnc! National Wi Switch You lb A Movie Flight. Only National Airlines has free movies to New York. have flown with us before. "Put Me On The Movie Flight." me, Im yours." And they'll put you on a movie flight. to keep kids out of pool rooms. Service and Vivian Becker, executive director of the Jewish Community Center. the work for Federation . "So I plead with you"
heritage .you didn't think of? Scherer and Rabbi Hyman Fishman. (second from right) and Jeanne Levy. or rTesiueui. of. *Q ; *u- t Democratic rival, Jimmy Carter. Lin him win the election and hear from him his tegrity," he predicted. Kes of Jewish interest and concern. Jewish vote is very important." accommodations It s the Monarch Sur! private facilities, phone, music console. service. Theater, Lounge. Night Clubi. 5 Bars. 3 Elevators. Swimming Pool. 56 Uona'cn SI* o M r#o-ld *""
Two of former California Gov. Boston; Melvin Dubinsky, of St.
a 10-minute period of his speech. tary of State Henry A.
bldg. low price of $31,000. there's no beef about these franks. Most Trusted Name in Kosher Poultry. at Juniors in the Mall on Sept.
major activity for this year. major thrust of this year's work. Nostalgia" on Oct. 16 at 8 p.m.
d'oeuvres and a cash bar. Beach. It was conducted by Mrs.
Mrs. Melvin Tanen and Mrs.
Community Center at 10 a.m.
and friends are cordially invited. Tuesday, Oct. 12 at 1 p.m.
guest speaker will be Rabbi F.
Chapter Education Day on Oct.
On Tuesday, Oct. 12 at 7 p.m.
will be held on Wednesday, Oct.
13 at 7 p.m. in Fellowship Hall. members are urged to attend. House in Boca Raton. Mrs.
War Veterans of the U.S.A.
Mr. and Mrs. D. Burke! of Fort Pierce and Mr.
Jean R. Terry of Bartow. NOW YOU CAN BUY ISRAELI-MADE "ALLIANCE"
VERY REASONABLE PRICES FROM BELLO'S TIRE CENT! |770O for reservations and / or details. )6th Graders at the JCC on Wednesday, Oct. 6 at 4 p.m.
er in advance. No charge. 1, Mannes College, Manhattan School of Music). h> Contest which opened at the JCC on Sept. 15. [Maximum registration has been set at 20 persons. ge. Last call is NOW! Couples of all ages are welcome. we Costs available upon request. i"sned by yuth when properly directed and encouraged. tnelTmurity Center Sukkah Come to the holiday gala. w mends and hear about coming events. o o WHO. WHAT. .WHERE? The record is clear that U.S.
to Israel is "for a good cause,"
Lissy quoted Ford as saying. where Israel's need is great." volved in any war crimes. of our party, are bound to fail,"
was a former SS member. Succot as "the time of our joy"
feast unto the Lord thy God . the process of taking place. which time we will be exultant. with a wonderful year to come. used here in its proper context. and once again become Simcha. early frontier days of our people. holiday of the ancient Jew. Succot are the Lulav and Esrog. the Jew to guard his speech. prayer of rain' is offered. nels for every seed planted. hundred doors or gates there. Sabbath services, Friday ol 8 p.m. Blvd., North Palm Beoch. Flo. I also has its good guys. Cn u" Bt leSt "
over again in big bold letters. i for Soviet Jewry. The family expects to leave by Oct.
| the last three years. share and of the central importance of Jewish education." difficult for each citizen as they are. Good Fence along Israel's border with Lebanon. 2815 N. FIAGLER DRIVE, WEST PALM BEACH, FLA.
color, national and ethnic origin. OF IE JEWISH FEDERATION OF PALM BEACH COUNTY. CASES IN PALM REACH COUNTY. Sunday Oct. 17 7:30 P.M.